Book Two of the Psalter reflects on the king’s commitment to the Kingdom of God. Psalm 147 praises God for providing for his people and building up his kingdom. The focus on the kingdom in this psalm is obvious in several verses: “The Lord builds up Jerusalem; he gathers the outcasts of Israel,” (v. 2); “Praise the Lord, O Jerusalem! Praise your God, O Zion!” (v. 12); and “He declares his word to Jacob, his statutes and rules to Israel. He has not dealt thus with any other nation,” (vv. 19-20a). This focus on the kingdom connects Psalm 147 with the language and themes of Book Two in several ways. The gathering of the outcasts, (v. 2), points to the provision of the Lord for the needs of his people. Psalm 147 further declares: “He heals the brokenhearted and binds up their wounds. The Lord lifts up the humble; he casts the wicked to the ground,” (vv. 3, 6). In Psalms 42 and 43, which begin Book Two, the theme of need is the repeated refrain: “Why are you cast down, O my soul, and why are you in turmoil within me?” (Psalm 42:5, 11; Psalm 43:5). We find that theme also in the last psalm of Book Two, Psalm 72: “May he [the king] defend the cause of the poor of the people, give deliverance to the children of the needy and crush the oppressor! For he delivers the needy when he calls, the poor and him who has no helper. He has pity on the weak and the needy, and saves the lives of the needy. From oppression and violence he redeems their life,” (Psalm 72:4, 12-13). The theme of prosperity with abundant food also unites Psalms 147 and 72. Psalm 147 praises God: “He covers the heavens with clouds; he prepares rain for the Earth; he makes grass grow on the hills. He gives to the beasts their food. He makes peace in your borders; he fills you with the finest of the wheat,” (vv. 8-9a, 14). Such blessing is anticipated in Psalm 72: “May there be abundance of grain in the land; on the tops of the mountains may it wave; may its fruit be like Lebanon; and may people blossom in the cities like the grass of the field!” (v. 16). All the praise of Psalm 147 revolves around a basis confession: “The Lord takes pleasure in those who fear him, in those who hope in his steadfast love,” (v. 11). At the center of Psalm 147 is perhaps an echo of the confession of Psalm 42:8, 11: “By day the Lord commands his steadfast love. Hope in God; for I shall again praise him.” God delights in his people according to his great covenant love. He is not impressed by human claims of power: “His delight is not in the strength of the horse, nor his pleasure in the legs of a man,” (v. 10). He delights in the living faith of his own people. God displays his unique provision for Israel in this psalm in several ways. He possesses extraordinary power and wisdom with which he blesses his people: “The Lord builds up Jerusalem. Great is our Lord and abundant in power; his understanding is beyond measure,” (vv. 2, 5). The wisdom and power that God displays in the stars, (v. 4), and in the rain, grass, and food for the beasts, (vv. 8-9), is the same powerful wisdom he uses to bless Israel, (vv. 13-14). God also provides for his people in a special way by giving them his word: “He declares his word to Jacob, his statutes and rules to Israel. He has not dealt thus with any other nation; they do not know his rules, (vv. 19-20). This word, which guarantees blessing and peace for his people, is the same powerful word that governs the world: “He sends out his command to the Earth; his word runs swiftly,” (v. 15). The word that controls the winter, (vv. 16-18), is the word that is a unique blessing of God to his people. The order that God’s word brings to creation is the order that God gives to the life of his people. Psalm 147, in contrast to Psalm 72, makes no explicit reference to the Earthly king of Israel. God is the only sovereign of his people in view here: “Great is our Lord,” (v. 5). Yet, implicit in this psalm is an Earthly king who truly fears the Lord, who sincerely hopes in his steadfast love, and who faithfully lives according to the statutes that God has given Israel. This king, as head of the people and kingdom, is to be found in Jesus alone. How is the focus on the kingdom in this psalm obvious? 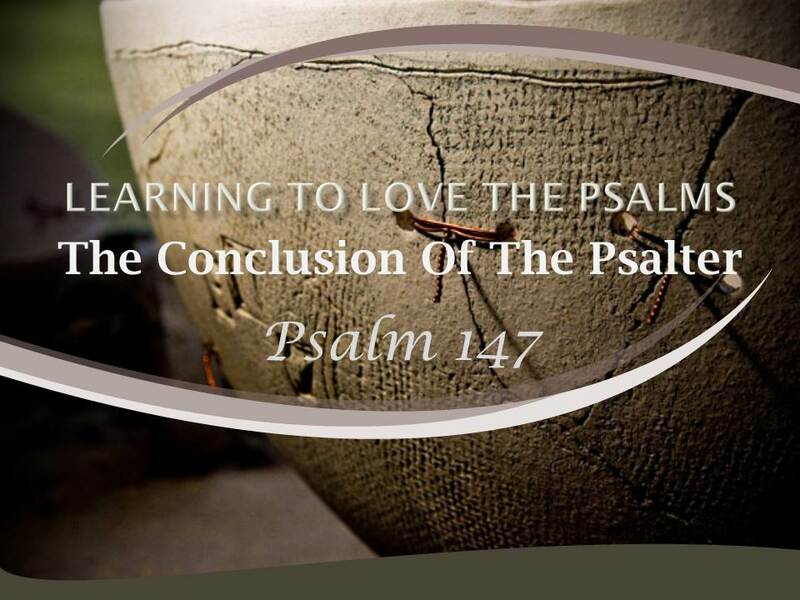 What basic confession does all of the praise of Psalm 147 revolve around? Do you have similar fear and hope? In what ways does God display his unique provision for Israel in this psalm? How do God’s powerful wisdom and his powerful Word inspire your praise of him?